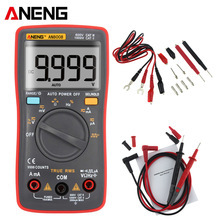 NO digital multimeter is accurate at measuring DC or AC current in low voltage circuits. The closer to full scale you get and the lower your circuit supply voltage gets, the more inaccurate your current measurement gets. YES, that includes your expensive “precision” 0.05% Fluke! How is this possible? – It’s called Burden Voltage. Many people are aware of Burden Voltage, but few people are aware of how bad this effect can be in practical circuit current measurements with a multimeter. Is your 1.2V circuit going to work at 0.86V?, or your 3.3V circuit at 2.96V?, or even your 5V circuit at 4.66V? That’s what a Fluke 87V meter will do to your measurement!, and that’s a GOOD meter. Even if your circuit “works”, what will that change in voltage do to your current consumption? Try the same again with a Fluke 77-III or 79-III, you will be SHOCKED at the result! Sorry! – you’ve just LOST one or two digits of resolution!, AND your meters 10A range is much less accurate than the 200mA range. Does that come as a surprise? That’s ok, you aren’t alone, most people are not fully aware of this severe limitation of their multimeter. As published in the April 2009 issue of Silicon Chip Magazine. PLEASE NOTE: Due to need to keep the burden voltage low, overload protection is NOT INCLUDED in the design. That means NO FUSES. Care is required in using the unit to prevent overloads. Download the original Altium PCB and Schematic files HERE.